This technology allows you to adjust food quality characteristics instead of just “cabinet air” characteristics. That’s right, your food stays Fresher for Longer than ever before. THE CLYMATE IQ® CABINET TAKES THE GUESSWORK OUT OF HOLDING FOODS AND PROVIDES SUPERB RESULTS EVERY TIME. Clymate IQ® cabinets start by quickly getting up to the programmed heat and humidity levels, twice as fast as the competition. Intuitive Climate Control™ technology automatically maintains the set levels of heat and humidity. Proper levels inside the unit means food is held under precise conditions, resulting in less waste. Clymate IQ® gets back to temperature fast. You don’t have to worry about losing heat and humidity if you open and close the door repeatedly during peak service time. The Clymate IQ® is Designed to Keep Foods at Optimum Serving Temperatures Through Peak Serving Periods, when performance matters. 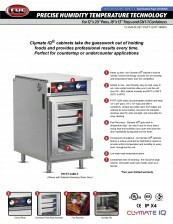 All-new PHTT Drawer Cabinets Available! In various 1, 2 & 3 drawer models! Learn more about Clymate IQ® in the PDF brochure above. View the CLYMATE IQ® “PHTT” SERIES Spec Sheet above. View the CLYMATE IQ® “PHTT-1220” SERIES Spec Sheet above. This Precision Heated and Humidified Holding Cabinet is making kitchens work smarter. Find out how by viewing our Clymate IQ® video. This 5 minute video could change the way you cook, hold and serve. Ultra Precision Control, Easily done. The User-friendly, easy-to-read, easy-to-set, color-coded controls allow you to set the unit from 10% to 90% relative humidity and 90°F (32°C) to 200°F (93°C). Select one of the below models to learn specifics, see literature, additional photos and more. Use the grey arrows to see additional models. We now offer various models of PHTT Drawer Cabinets!